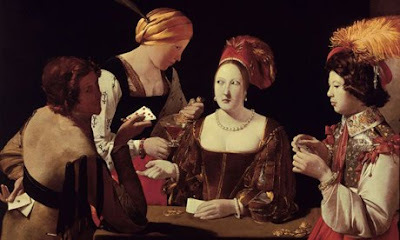 Lorraine artist Georges de La Tour (1593-1652) painting The Cheat is a social commentary. A shrewd card shark is about to cheat a vacuous young man. Compliant in the scheme are the well-dressed woman and her servant. 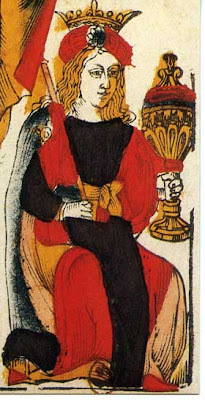 Playing and Tarot cards started out as a diversion for the aristocracy and wealthy of Medieval Europe and probably were Middle Eastern in origins. The cards engraved and painted by artisans were very expensive. In the fifteenth century woodcut decks developed. Suites evolved from Islamic symbols of the chalice, swords, coins, and polo sticks. 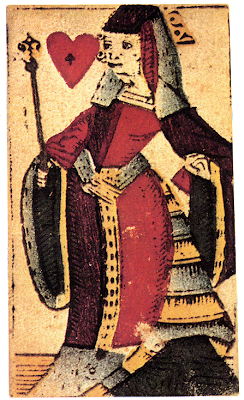 The queen of hearts is from a Claude Valentin playing cards deck and the queen of cups a Jacques Viéville tarot deck. Both are mid-seventeenth century. Cups the precursors of hearts, were emblematic of love and happiness.